Hey crew! It’s been absolutely wonderful seeing so many new people drop by Guac, even though I was only writing the same sentiment at Christmas too. Thank you! It’s so great to have feedback from new visitors on Twitter and Instagram, and see Guac & Roll pop up in searches and generally seem like a useful resource. Because there’s so many of you now, I thought it would be a good time to answer a few more questions. These ones are about Guac and being vegan in general, but if you’d like to know a bit more about me, check this post here. Where else can I follow Guac? On Instagram, on Twitter, and, as of today, on Facebook! I also have a personal Pinterest account, but when I get a spare day in the coming weeks I’ll be making a new Guac one too. Where do you get your ideas from for your recipes? All over the place! I love restaurant and street food menus- whether they’re vegan or not, seeing what other cooks and chefs have paired together or focused on can be really inspiring. For recipes at home, it’s usually from needing to use up a vegetable we have in excess from our vegetable bag, which is why I’ll always appreciate a new beetroot recipe. I also get a lot of inspiration from my parents, who cook a lot and for their friends, so we’ll always talk through what’s been working well for them. Actually I pretty much talk about food all the time. So really my ideas come from a kind of constant stream of conscious/ obsession with making the next meal! Do you cook like this every day? Kind of! I’ve been working from home for a few years now so I’m really lucky that by about 6pm I can start making dinner from scratch, and I usually spend about two hours making it. My friend Tsouni once told me she sees cooking as something you can get 5% better at every time you make something, and I think that’s really true. So I often cook things I need to practise at for a supper club or event, or test out ingredients I have in mind for a blog post. BUT I’m also not opposed to the odd microwavable rice and salad meal, and have a total jones for garlic bread, so no, it’s not homemade every single day. How do you find vegan places when you travel? Instagram is a great resource for travelling because it’s so up to date. Instead of buying a year-old travel guide or checking a website/ forum post that’s a few years old, I find Instagram is a really reliable way to see who is saying what about the places you might want to visit. A good trick is to search for the place in English with ‘vegan’ in the hashtag- such as #veganBerlin, and then look at the rest of the hashtags the person posting has used- they’ll often write the equivalent translation in their own language (e.g. German) too, and then, when you click on that hashtag, you can check out what local vegans are eating too. If I’m in a hurry I use Happy Cow, which is an amazing resource for vegans and vegetarians, but it can often be a little outdated. I find it best to cross-examine the suggestions on there with recent Instagram posts. The other great thing about vegans is that they’re always pretty happy to help another vegan out! So send out a tweet or email a few friends who may have been to the same place you're headed- I’ve been so surprised by the efforts vegan pals I’ve made online will go to help another vegan out. 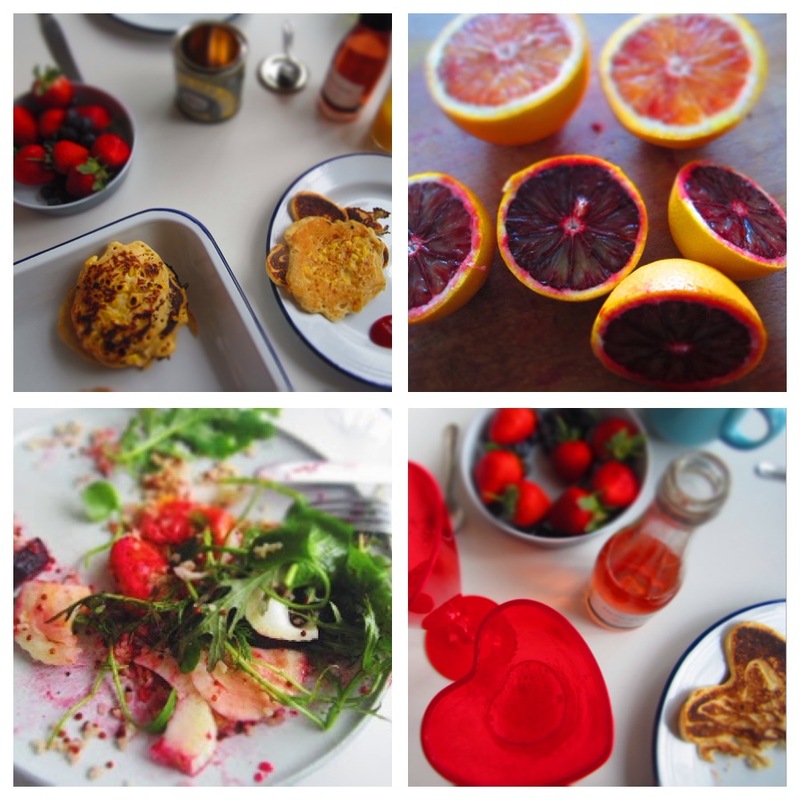 Who are your favourite cooks/ Instagrammers/ bloggers? I chatted a little about this back in December, but it’s always good to shout out a few more mega-talented peeps, right? I love Isa Chandra Moskowitz for practical advice, @takeamegabite is amazing for baking inspiration and @homegrownsmoker for RIDICULOUS vegan creations I wish I could eat every day. 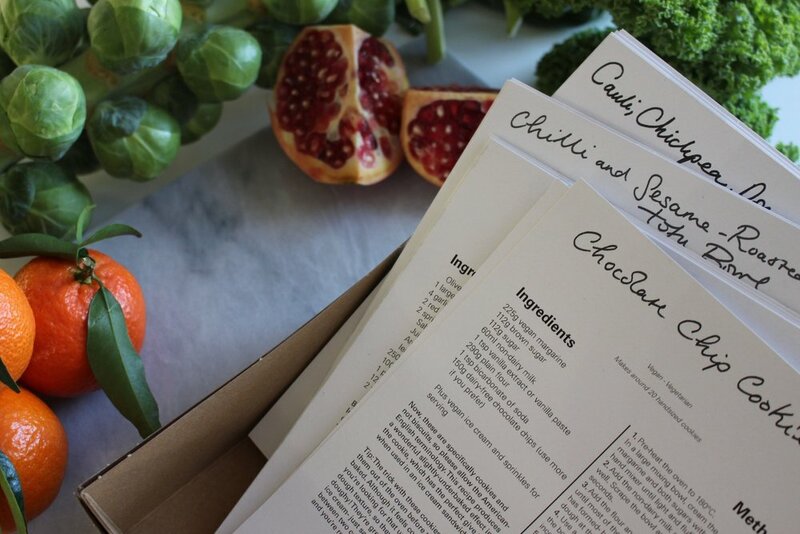 @claracakes for awesome baking and catering by super-talented Clara Polito, @florescent_herbivore for inspiration to make meat-free alternatives to classics like biscuits and gravy, chicken pot pie etc. And finally @_faringwell for really understated photography of plant-based food. I want to make friends with other vegans but I don’t know any! I have vegan friends online but is it weird meeting them in real life? How do you do this? I get asked this a lot and I’m not sure what to recommend because I think a lot of people make friends in different ways :) I have made a lot of friends through talking online to people, but this isn’t often the most practical or safe advice to give. If you’re meeting people from the internet for the first time, definitely always meet in the middle of the day at a busy place like a train station or cafe, and go for a coffee or drink first! Or you could arrange to meet at a local food market. If there’s a few of you, you could all get tickets to a vegan pop-up or supper club, as there will be lots to talk about. The other thing you can do is agree to each bring along a friend- especially if you each have a vegan friend. Make sure other people know you’re going, check in with a mate or your significant other while you’re there, and keep it short and sweet. I sound like I’m running a vegan dating site, but it’s always good to have an initial meet-up with a new friend before committing to spending a few hours together, you may just not get on that well in real life! Other cool ideas to make friends could be to talk to your local vegan cafe or health food shop about putting on an event like a bake sale, a gig or a fundraiser. 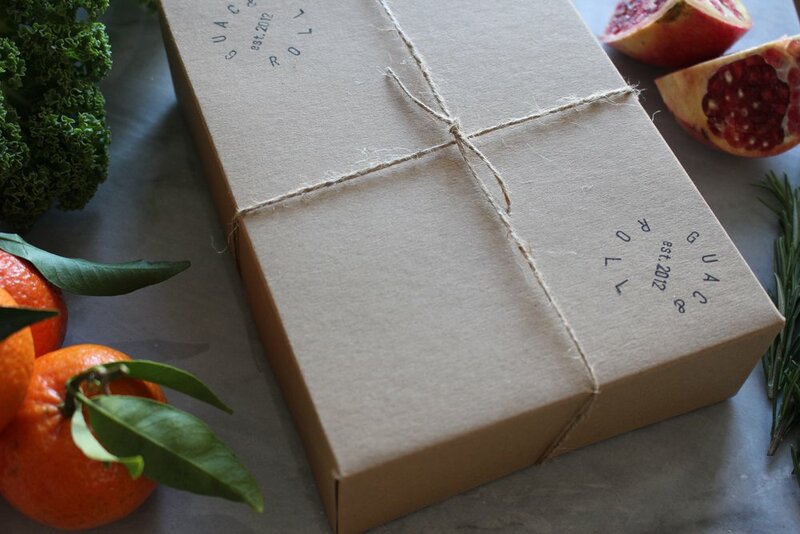 These are less daunting than a supper club and other vegans can get involved helping you. You’ll get to make friends as well as raising money for a vegan cause or just covering your costs on a bake sale to promote a local vegan shop or business. Where can I go in London for good vegan food? I’m super passionate about supporting the vegan businesses we have in London (and the rest of the UK, of course) because without the support of other vegans, it’s really tough to convert meat-lovers. Club Mexicana, Mildred’s, Cook Daily, Fed By Water and G Kelly Pie and Mash all do great totally vegan menus or vegan options that need your support so they’ll stay on the menu. Black Cat Cafe in Hackney, The Hornbeam in Walthamstow, Sagar, Maoz Falafel, The Gate pub in Islington, Loving Hut in Holloway, Sakonis in Harrow, The Gallery Cafe in Bethnal Green and The Waiting Room in Deptford also all offer great vegan menus or vegan options. Can I email you about a product or brand launch? Do you cater for weddings/ parties/ photo shoots/ anything else? Yes! Again, drop me an email at guacandroll (@) hotmail.com so we can talk about what you’d be looking for. Where can I eat Guac food? This year I’m working with the incredibly talented peeps at Frank & Olive as their resident cook for their crochet retreats in Yorkshire. 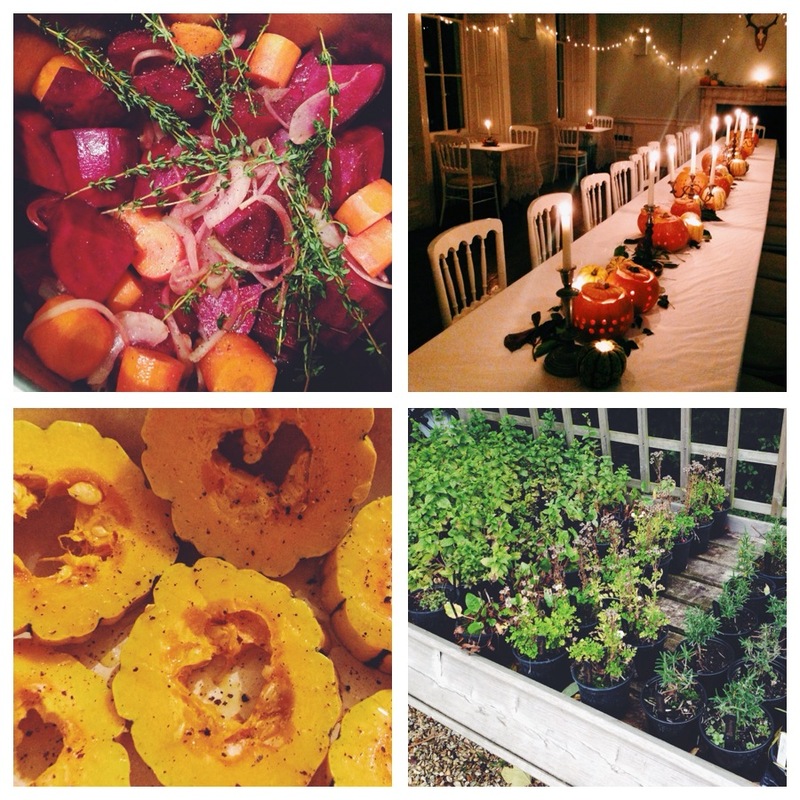 There are eight more retreats taking place in 2016- you can check out their website here to see the amazing weekends they put on, where I cook from Friday through to Sunday. If that’s too far-afield for you, I’m also looking at putting on the first Guac & Roll events in London this year. Again, drop me an email at guacandroll (@) hotmail.com and I’ll make sure to put you on my ‘first dibs’ list so you’ll get an email when the first tickets go on sale. And for anyone in Berlin, I cook with the Poppadom Preach crew two-three times a year. We’ve just sold out our second event, but look out for info on our summer 2016 event on my Twitter and Facebook pages. I've now been a vegan for over two years (WOOP WOO). I've already talked plenty about why I decided to go vegan in January (not to do with a resolution thankfully! 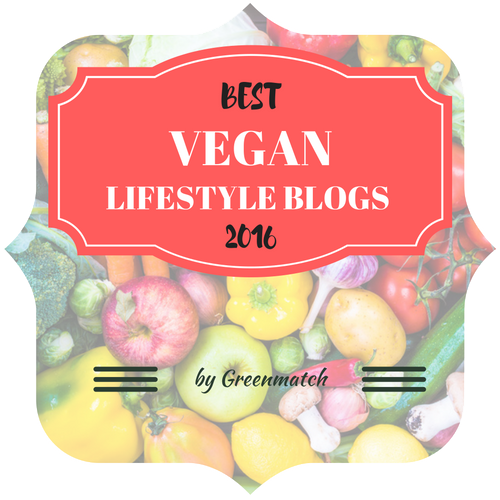 ), so apart from getting all the highlights from 2013 together on one page, which I'm really geekily excited about, I thought this post would be great for all my friends trying out Veganuary or just eating less meat, fish, eggs and dairy, and experimenting with vegan recipes (HI EVERYONE!). Although I'm not in to making resolutions, I think taking stock of the previous year can be a good starting point to see what you want to change for the next year, without the pressure of falling at the first hurdle of Monday mornings in the office and being reuinted with your fave curry house (oh Sweet Lemon, how I missed you). January began in the ideal way: with copious amounts of Thai-style coconut and chili broth. It continued with visits to the Clapton Hart for their vegan burgers. The Hart has to be one of my favourite pubs to eat at after all the amazing vegan food they put on in 2013. A pub with a vegan roast dinner that's walking distance away? Where do I sign? February= my birthday month so obviously sweetcorn fritters are the name of the game here. I stuck with the classic for my birthday breakfast, while my boyfriend couldn't quite handle the idea and chose golden syrup with banana and blueberries instead. Pft. When not stuffing our faces full of pancake batter I also managed to make a few wintry salads, including this fennel, beetroot and blood orange one. In March I made a spruced-up vegan fry-up with refried chipotle beans and spinach and mushrooms, and pretty much carried on making that every Saturday for the rest of the year (it's happiness on a plate you hear?). As for pies, I went for thissquash and potato one with braised red cabbage and a good dollop of mustard. While March seemed to never want to leave winter alone, I also concocted the warming lentil salad above as some kind of sundance. I'm not promising it will work, but I can vouch for it being tasty enough not to matter. April arrived and with it, the onset of sunlight, bubble and squeak and e5 bakehouse coffee. I seriously cannot get enough of that stuff. So one Saturday we cycled down to Hackney Central to get their Hackney Wild loaf, which is some of the best bread I've ever tasted, and sliced it up with bubble and squeak and a bit more black coffee. Going back through my posts now makes me realise just how long we have to go until dinner in daylight again (sob!) but that's exactly what I was celebrating in April 2013, when I made three salads to eat in the evening sunshine (yes I'm pushing it, it wasn't sunny, but the clouds definitely parted). In anticipation for my parents battling the north circular to come and see me, I made some vegan stop-over snacks that wouldn't ruin our appetite too much for pizza later on that night at Sodo in Clapton. We had Jus-Roll croissants I baked at home the next day, and I also conquered my fear of homemade hummus (not sure where that came from...) and made the first of about 1,345346 batches last year. I over seasoned it, put in way too many different flavours, but it still turned out okay, which is why I <3 CHICKPEAS. Treat 'em nice and they'll never do you wrong. Primavera takes place in May but because I was in Barcelona having TOO MUCH FUN and then in recovery from ALL THAT GOODAM FUN, I didn't get around to writing about it until June. Which was probably a good thing, give some of those brain cells time to recover and you know, start forming sentences and such. I wrote about my experiences in VEGANZDREAMVILLE aka Primavera festival right here. But if you're too lazy to read that, just know this: vegans will eat well in Barca. Even after a one hour train journey out of the city and up a mountain to a monastery, you will find enough vegan and even gluten free food to feed a small army. We're in to July now, and this is full-fledged summer bizznizz. I put those hummus skills to the METTLE and made a lot of it, essentially, and this beet hummus right here proved to be the bomb for afterschool snacks (yes I still have those). I alsonipped over to Berlin and ate some of the best food of summer including amazing seedy bread and olive oil, vegan burgers, club mate (yes mate) (not a food, I don't care), vegan Turkish brunches and the best scorching-hot-day breakfasts (as pictured). I did a crazy bike ride in July which I was also apparently still recovering from because it didn't appear on Guac until August! Perhaps in part because of how many of these ruddy flapjacks I made. They were great, and probably survived the 90 mile overnight ride better than I did, because they were still tasty the next day, where as I was exhausted, barely able to stand, and prone to crying at things like very cute pub cats. August stayed hot for a long, long time, which was ace. So maybe it was the heat that got to my head when I made this MASSIVE vegan birthday cake for PRECISELY NO-ONE one Sunday. We had to recruit our lovely neighbours Ali and Thomas and my best mate Amelie in to help devour it- and even she ended up leaving on some weird sugar high after about 30 minutes. My bad, good frosting though. September was probably one of my favourite months of the year. I re-homed Guac & Roll to its new gaff right here at Square Space and landed a new column, The Vegan 411, over at HelloGiggles. I did a lot of cooking and baking, but most of it was behind the scenes, which is why it looks business out front! (Queue weird picture of a website within a website WOAH META). October brought with it my first Vegan 411 column at HelloGiggles. I made a lot of chocolate brownies to test recipes for my column (raspberries apparently are not that keen on getting involved with vegan brownies, fair play) , and went to an amazing Halloween party with vegan pumpkin stew and gourds AS FAR AS THE EYE COULD SEE. I also started delving in to the world of vegan beauty products and have been tracking my progress since on Guac right here. 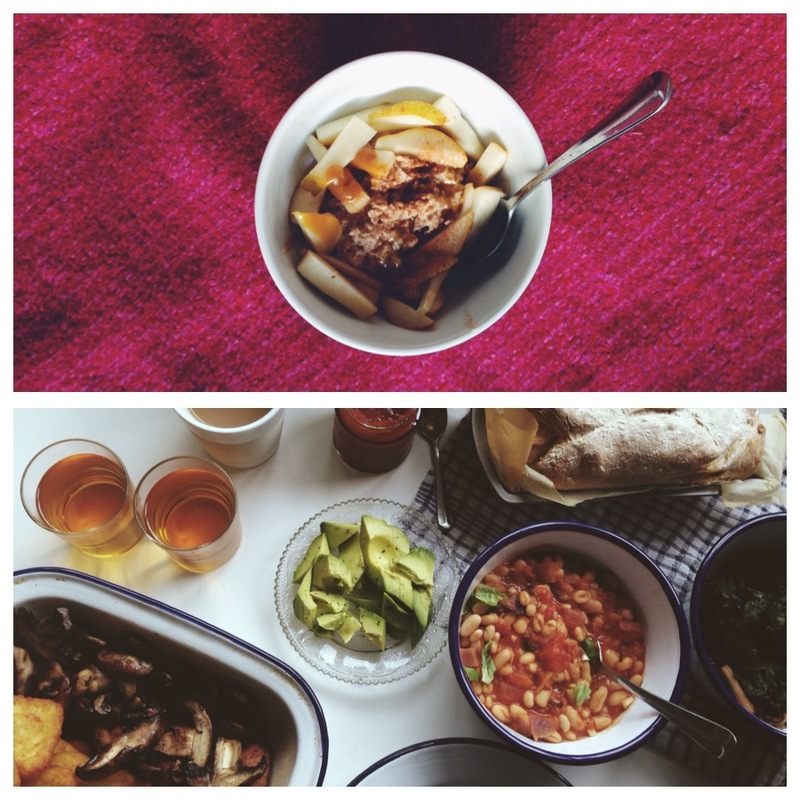 My two fave comfort foods featured pretty heavily in November- chana masala and smoked tofu with stir-fried vegetables were two really easy ways of keeping bright, filling meals cheap and not too monotonous as winter set in. The tahini chopped salad I adapted also works really well for keeping lunchtimes vibrant when darkness and office hours collide. November ended with a trip to Portugal, where I found vegan burgers and amazing coffee in Lisbon, not to mention the best tasting cannellini beans ever for breakfast and a vegan buffet I've grown a bit obsessed with. I want those aubergine fritters back in my life. I spent half of December at home with my parents, which I am yet to feature on Guac since the onset of NYE, but before I zipped off, I made beet and chard hash for a wintry brunch and bhelpuri for a potluck, as well as some vegan truffles that got sent all over the UK. So that's all for another year folks! Thank you so much for reading Guac & Roll and to everyone that gets in touch on Twitter, Instagram and email. I am SO excited for all the surprises and hard work 2014 has in store. Oh yeah sure, just whizz on by November! Eat and run! 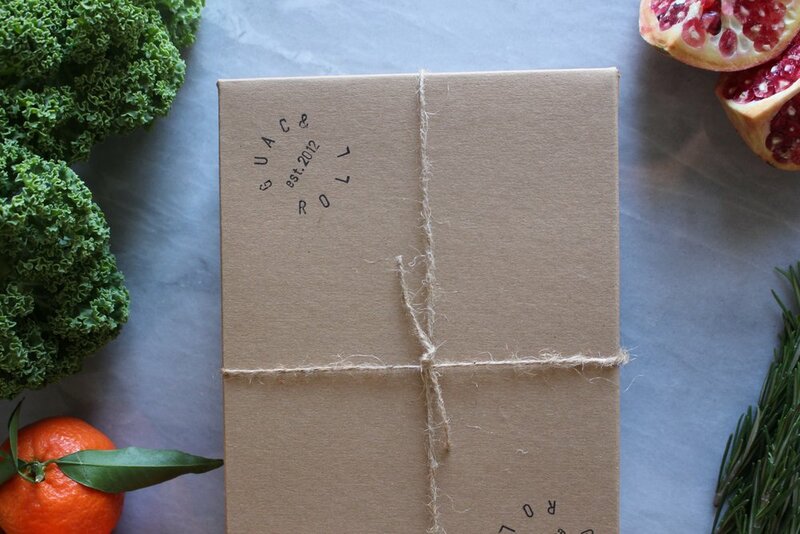 Here's some sneak peeks of what was going on in the world of Guac & Roll in November. 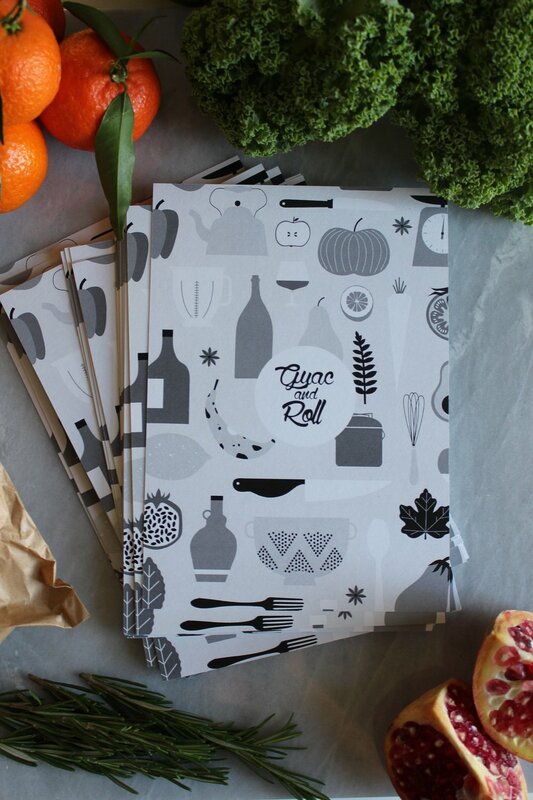 If you'd like REAL TIME updates, add @avainlondon on Instagram, or @guacandrolluk on Twitter. In the often mis-quoted words of All Saints, I know where it's at, and that place is a vegan breakfast. November featured some tip-top starts to the day, including the porridge above that was made with my friend Ruth's homemade almond milk, and topped off with pear, cinnamon and homemade dulche de leche sauce. Beneath that is the vegan fry-up I decided to go king size with, and added homemade bread, baked beans and my friend Amelie's homemade ketchup. November was the month I discovered a soy milk alternative that could hold its own in a cup of tea, and that's oat milk! 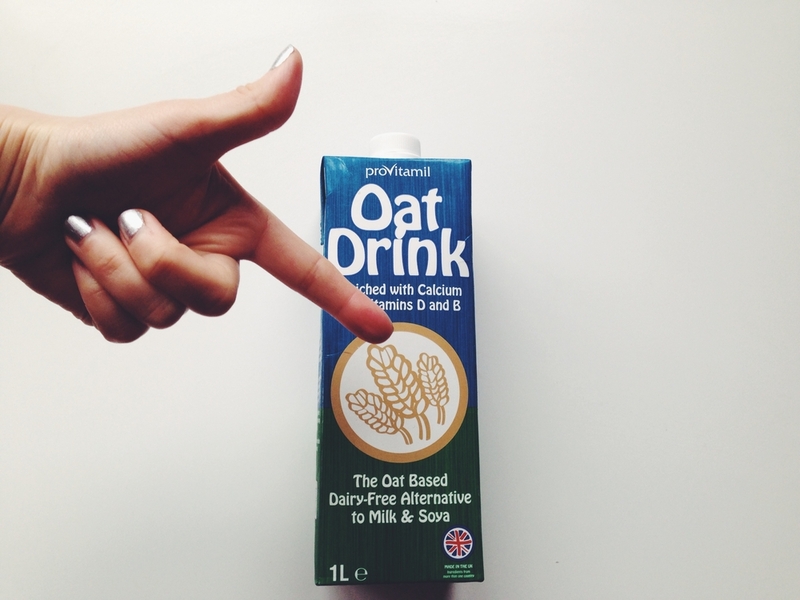 I've tried a few brands now but this one, Oat Drink, is the tastiest for tea, coffee, porridge and cereal, and so far I haven't seen it do the weird breaking-up thing soy milk does in coffee and other hot drinks sometimes. Win win! Another discovery was orzo- which I found in my local Morrisons supermarket. I have of course seen orzo in a ton of Pinterest recipes, but never in shops or on a menu, so I was really excited to try it. It's basically rice-shaped pasta, and is so so good in warm salads and I imagine in soups and broths too. I teamed it with roasted delicata squash, onions, crispy kale, hazelnuts, tortillas and homemade hummus. It was more of a eat-up-what's-in-the-fridge recipe before we went away, but I'll conduct some more experiments and have a recipe for Guac ASAP. Finally, two extremes of meals with my best friends Ruth and Amelie. Noticing a vegan corn-dog shaped hole in our lives, Amelie decided to put the world to right with possibly the tastiest dinner I've ever had. The corn dogs alone would have been enough, but the homemade twice-fried fries and bean burgers just tipped it over the edge. I didn't eat for another day. Away from Elvis-style Scooby Snacks, I went back over to Ruth and Amelie's to talk all things vegan, sugar and gluten free with Ruth. She made us this awesome breakfast above, complete with homemade bakes beans, almond milk, pancakes and mushrooms with avocado oil, which were like mushrooms 2.0, basically. Here's some behind-the-Guac-scenes action from October, despite it feeling like only a week ago that I was rounding up September! You can follow behind the scenes of my Guac & Roll adventures on Instagram- @avainlondon, and if you use Pinterest anywhere as chronically as I do, you can find Guac over there too- by clicking here. From barbeques to baking- it wasn't until I put this month's photos together that I realised there were no more grills or pub gardens featuring, but lots of recipe testing and recruiting friends to help eat up the 4 batches of brownies I made to trial for my first Vegan 411 column for HelloGiggles. Apart from the fact that raspberries and vegan brownies do not seem to mix, October also bought with it an amazing homemade apple and sultana crumble from my best friend Liz's family's farm. Keeping with the hunkering down/ vegging out nature of the month- I worked on my pumpkin chili recipe and apparently couldn't get over how ace purple carrots just are. I moved desks down to Naomi's for a change in scenery and developed what some people would call an unhealthy attachment to huge bowls of steamed vegetables and rice for every meal. I'm now banned from uttering the 'r word' (rice) in the flat. BUT IT JUST TASTES SO GOOD. Finally, I dropped by Bardens Boudoir for lunch on the last day of October and had a crazy good smashed avocado on toast, topped off with sunflower seeds, rocket and the most delicious mushrooms I've had in forever. When pickling onions left my flat with a slight vinegar tinge, I made like Cher Horowitz and baked up some bread to create something gorgeous to smell instead. Speaking of which, if I ever reach my chana masala capacity, give me a good talking to yeah?